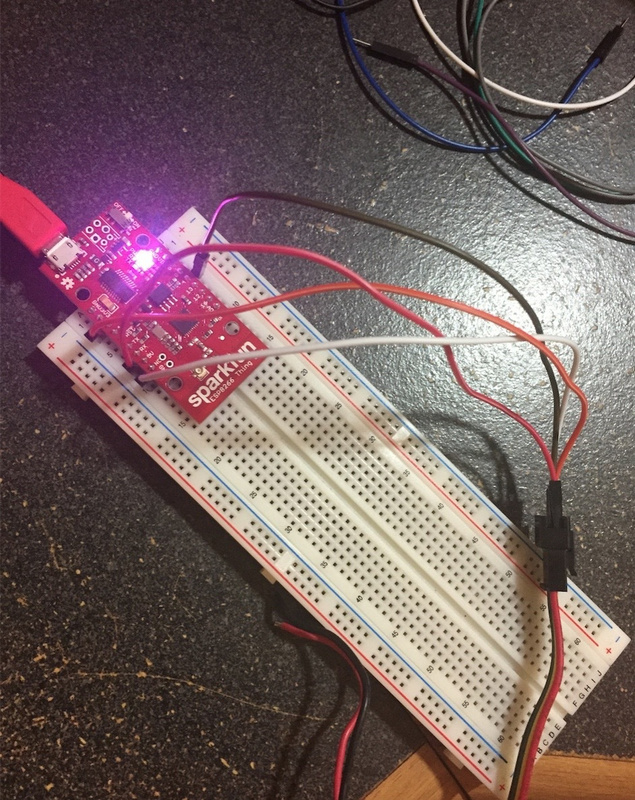 How to connect Blynk to my Sparkfun ESP8266 thing? Is this the right place to post code and see if people can give a solution/recommendation or do I have to go to a different website. I can post the code I have currently. > // You should get Auth Token in the Blynk App. // Go to the Project Settings (nut icon). thats the first fail. Initiate a timer and rework your code with that. Many examples on this forum. Then get back here if it still fails. What do you mean by “initiate a timer”? You mean add another delay (maybe after Blynk.run?) or create a whole new method with a Timer class? What do you mean by “initiate a timer”? You should post your new code (correctly formatted this time) and full details of the results your getting. Does the device connect correctly then go off line when you perform a certain action in the app. What results are you seeing in the serial monitor? (Don’t post screenshots copy the results and paste them with the same formatting as you use when posting code). Ok heres an update. It doesn’t say “offline” anymore when I run the project in Blynk, which is progress. Thats a plus. Basically what I did was removed all the delays and moved the “Blynk.run()” command directly under the void loop. But another issue. 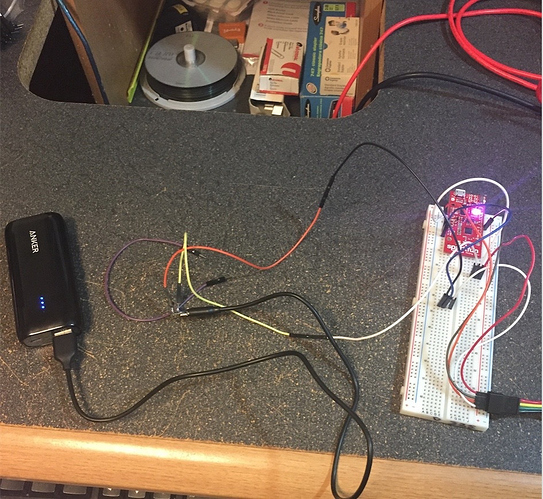 My LED (Adafruit Dotstar) isn’t lighting up (or doing anything) when I mess with the sliders in Blynk. Everything is wired up good and goes in sync with the code. GND on the LED strip is connected to GND. 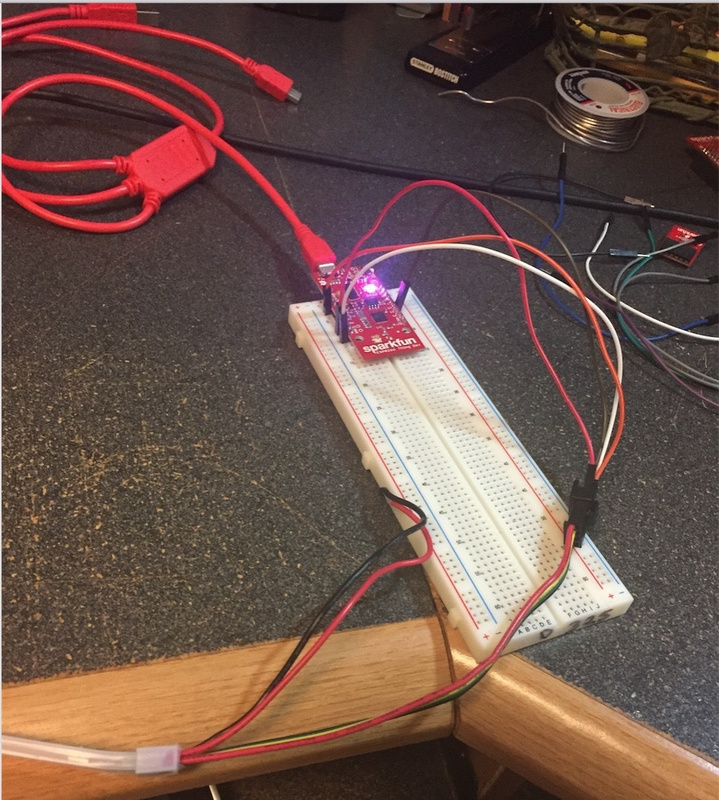 VCC (on LED strip) connected to 5V. Clock connected to pin 2. Data input connected to pin 4. How are you powering your LED? I figured it would happen through the board. I have the LED connected to the Thing, which is being powered up from my computer. That should power the LEDs too right? I’m not familiar with your board, or the LED strip that you’re using, but your code defines 60 LEDs in the strip and I would doubt that the board could provide the necessary current via the GPIOs to supply that many LEDs. but your code defines 60 LEDs in the strip and I would doubt that the board could provide the necessary current via the GPIOs to supply that many LEDs. You are trying to duplicate an older demo… but this is the GitHub page for it… and yes, I think it needs Processing for the music interface. senior project. Contribute to ppchu/musicled development by creating an account on GitHub. However after a few years, libraries changs, so you may not be able to simply duplicate it without lots of learning about what and how to change. So I was watching a video demonstration of Blynk. 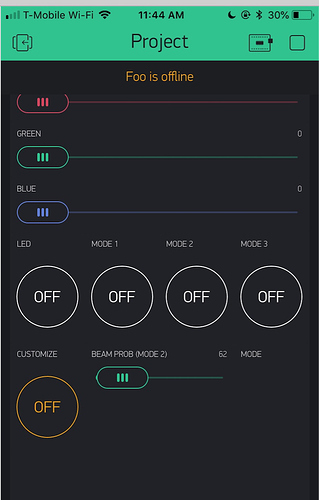 Can someone tell me the name of the button on the bottom right “mode”. 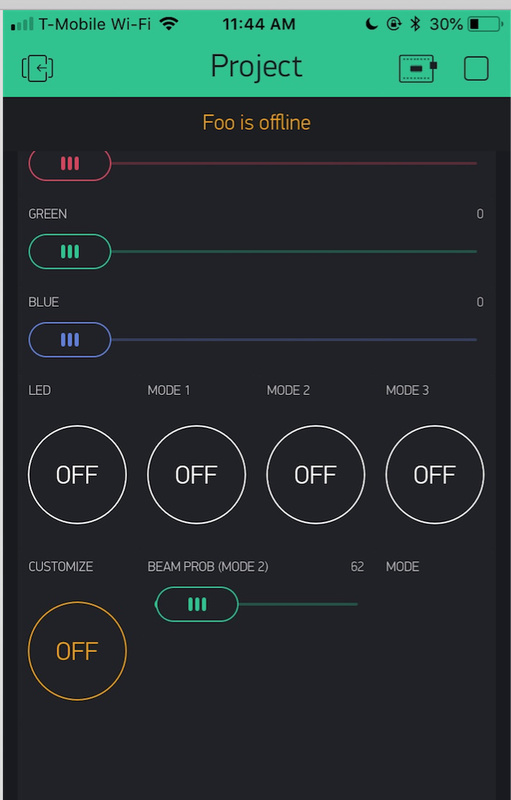 And how did he sync it with the other 4 “modes” so it shows which number mode the LEDs are in? Does it do that automatically? There are 5 standard buttons, 4 sliders and 1 display (probably what you are referring to in the lower right) shown in the app. It will be the code that makes them do and display different things, not the widget itself. PS, I am merging all your seperate topics as they are all about the same thing. Please do not keep creating new topics on this project of yours… use this one. Thanks.